FILE - Chinese tourists take souvenir photos with the Chinese national flag as they visit Quanfu Island, one of Paracel Islands of Sansha prefecture of southern China's Hainan province in the South China Sea, Sept. 14, 2014. China’s opening of its southernmost province to visa-free foreign tourism next month could make features in a nearby, widely disputed sea more accessible to curious travelers. Hainan province will waive Chinese visas for citizens of 59 countries starting May 1, state-run media say. On their 30-day visa-free stays, some may be able to set foot on Chinese claims among the reefs and atolls southeast of Hainan as part of the province’s free-trade port ambitions, said Zhao Xijun, deputy School of Finance dean at Renmin University of China. Some of those features belong to the Paracel Islands, an archipelago that China controls but that Taiwan and Vietnam also call their own. “This is something for the future. It’s not just for outside visitors, but domestic travelers also will try hard in this direction,” Zhao said. FILE - Chinese tourists enjoy scenic Quanfu Island, one of Paracel Islands of Sansha prefecture of southern China's Hainan province, Sept. 14, 2014. Opening the Paracels to foreign travelers would help China politically, some analysts say. Beijing could show people from many countries it has “effective administration” over the contested sea, said Collin Koh, maritime security research fellow at Nanyang Technological University in Singapore. Other countries would be unlikely to hassle China if they knew foreign tourists were at sea, he added. Brunei, Malaysia, Vietnam and the Philippines claim parts of the South China Sea, which is valued for fisheries and undersea energy reserves. China and Taiwan call the whole 3.5 million-square-kilometer sea their own. FILE - An aerial photo taken though the window of a Philippine military plane shows the land reclamation by China on Mischief Reef in the Spratly Islands in the South China Sea, west of Palawan, Philippines, May 11, 2015. The other countries resent China’s expansion of islets in the Paracel and Spratly chains for military use. China, which has Asia’s strongest armed forces, is building on at least three Paracel islands, an American think tank project said last year. Woody Island, the most developed Paracel feature, has a resident population of about 1,000 people. Facilities include an airstrip and missile batteries as well as a hospital and a supermarket. It’s unclear whether foreign tourists are now allowed to visit the Paracels, a spokesperson with the Chinese travel booking service Ctrip.com said. A publicist with the city of Sanya, a southern Hainan resort city and the one closest to the Paracels, said Friday the municipal government website would eventually post information on who can visit the South China Sea. Paracel tourists would expect China to keep the marine environment clean so they can see pristine scenery, said Lin Qi, assistant researcher with the National Institute for South China Sea Studies in Hainan province. China is already trying to open tourism to the disputed sea, with a long-term goal of letting people surf and dive in the tropical waters. China’s first cruise ship set out for the Paracel chain in 2013, and in 2016 a Chinese airline opened charter flights from the Hainan provincial capital Haikou to Woody Island. In March 2017, a cruise ship from China took 300 people to the Paracels, and Vietnam protested on grounds that it has sovereignty. Amphibious private aircraft can reach the tiny islets with no airports, said Michael Shih, vice president for strategy and business development with Textron Aviation in Shanghai. 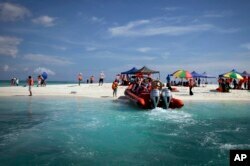 Aerial tourism is already being done in Hainan province, he added. The islands under China’s control lack tourist-caliber infrastructure, such as hotels and potable water. Those shortcomings could limit arrivals, Zhao said. “Maritime leisure is a developing industry in China. Infrastructure and overall levels development are still in a low state,” he said. Malaysia and Vietnam are also opening tiny islets in the disputed sea to tourists as a way of proving claims. Countries that promote tourism may hope to advance their political claims, said Christian de Guzman, vice president and senior credit officer with Moody’s in Singapore.